There was a very special group of people at the show on Friday including a bunch of family members and friends who had the pleasure of knowing my mom. For today's Life is Sweet post I wanted to share some memories that they had shared with me about my mom as I was putting together the show and the blog series. Due to circumstances beyond their control, my mom and her two older sisters did not grow up together and were separated for 25 years. My mom called their reunion a dream come true, something she had wished for for many years. I feel so lucky to have both of my aunts in my life and it was wonderful to have them both in the audience. My aunt Sharon sent me a story being reunited with my mom in 1993. "Can you imagine sitting at a restaurant and seeing two woman staring at each other and hysterically laughing at each other? People probably thought we were crazy. Each time we would start a conversation, we would go again laughing and crying at the same time. It was us looking at one another after 25 years apart. It was like looking in a mirror at ourselves. We couldn't get over it." My Aunt Sandy said that one of her favourite memories of my mom was a weekend in 1997 when my mom and Aunt Sharon went to visit Sandy in Quebec. She said they laughed from the time my mom arrived until she left. Sadly it was the last time she saw my mom. 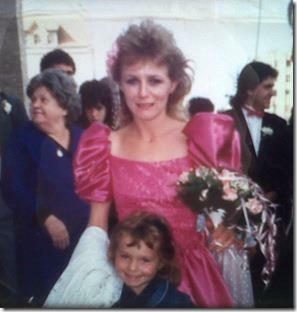 One of my favourite pictures of my mom and I was taken at her friend Brenda's wedding where my mom was the maid of honour. "I remember the first time I saw sadness in your mom, we were still teenagers. She hadn't gone to school for a few days and when I called her she wouldn't come to the phone, so I finally just knocked on her door, your grandmother let me in. Your mom had her wrist all wrapped up. It didn't jump out at me like you think it should have, it was her sadness that jumped out more. She was numb. She told me she cut herself in a attempt to take her own life. Why, a thousand times over... WHY? She said pain and hate; it choked her. I never understood; she was so popular, had lots of friends, always seemed happy to me - what was I missing????? Until that day I didn't know things were not the way they appeared. I have learned though your Mom's death that sickness doesn't always show itself, that depression is isolating. I knew she had an illness, but I never really saw it... I saw my friend Debbie Gibson... beautiful inside and out"
At the show I shared a story about my mom that my friend Tamara had sent. Tamara and I were inseparable in the seventh grade and my mom loved her like a second daughter. "I remember the day we went to Gerrard Square and you bought that greyish blue long skirt for our upcoming dance. When we got home you tried it on for your mom and we talked about the boys we were into at the time. Your mom just sat and talked with us, she was attentive and smiling. I love that she was always supportive. I don't ever remember her saying anything negative to you or hurtful. Her words were always warm and loving. She completely accepted me like her own and I always felt welcome around her. It always felt easy talking to her, especially about boys"
I told this story at the show, because on the day I bought that skirt I also bought the first Spice Girls album (which became the soundtrack of my life for the seventh grade) I talked about seeing the Spice Girls in concert a few years ago and how fascinating it was to see how the meaning of the songs had changed for them, especially Mama. That song has also taken on a very different meaning for me and I was very happy to include it in the show. I can't believe it's been 15 years that she's been gone. I've felt closer to her this month than I have in a long time and I'm so thankful for that.